The only runner I’ve seen mentioned in early Buddhist texts was a serial killer. That’s probably a dumb thing to put in a blog created to show how compatible running and Buddhism are. Worse still, the killer in question – a guy named Angulimala – chose the Buddha as his 1,000th victim. 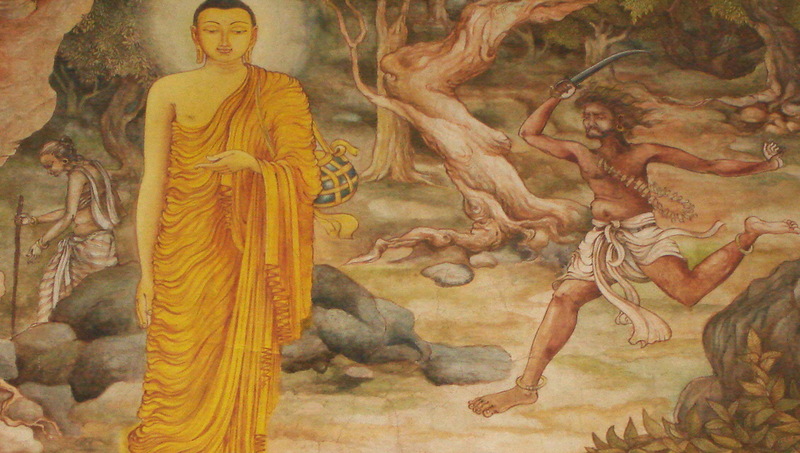 Angulimala, spotting the Buddha in the woods, raised his sword and sprinted toward his target. He turned his legs over at top speed while the Buddha, who was only metres away, continued to walk calmly. Yet somehow Angulimala was unable to catch up to make the kill. Angulimala demanded to know what the Buddha meant. “I have stopped, Angulimala, once and for all, having cast off violence toward all living beings,” the Buddha answered. So impressed was Angulimala by the Buddha’s words that he dropped his weapon, pledged himself to the Buddha’s teachings, became a monk and ultimately realized full enlightenment. I find great value in the story of Angulimala, for a few reasons. The first is that I don’t need to believe it really happened. I appreciate being part of a broad religious community that allows me to accept lore as lore, that doesn’t demand I accept scripture as historical fact as a prerequisite to spiritual practice. Some of the Angulimala story may have been based on real events. How much? Beats me. Hundreds of years had passed after the Buddha’s death before the story was written down for the first time. A career in journalism has taught me the details of a story can get all screwed up within seconds, never mind centuries. That the Buddha was meant to be Angulimala’s 1,000th victim strikes me as too tidy, though I’ve always been a skeptic about round numbers. When I see lists – like “10 sensational post-run stretches to prevent injury” – I question the odds of there being such a nice, round sum. Are they all truly sensational, or were a few sucky ones tossed in for padding? Or maybe there was an 11th that got axed, just because 11 doesn’t have as clean a ring as 10. I also don’t buy that Angulimala, who was said to have been able to outrun chariots, wouldn’t have been able to catch the Buddha. Some competitive speed-walkers might disagree. While the details of Angulimala’s encounter with the Buddha seem farfetched, they’re effective in conveying certain truths. Two in particular have hit home for me, on and off the trail. They’re the other reasons I’ve come to value this story as much as I do. For me, the tale offers encouragement that no matter how set in their ways people seem to be, absolutely everyone has the potential to change, at least a little. It also shows that if you want to make wiser choices, taking extra care not to cause harm – including to yourself – ain’t a bad place to start. My introduction to running gave me a small taste of these truths. An overweight chain-smoker, I’d resigned myself to a diet of chicken wings and cigarettes. I never would have thought deciding to stick to a stupid running program for a whole lousy week would lead to any meaningful lifestyle changes, but it did. More significant, though less apparent, is the transformation I’ve experienced through Buddhist practice. Spiritual transformation hasn’t been about becoming someone new, but rather seeing the possibility of loosening the grip of unhelpful tendencies. I’m hardly the friendliest or most patient person you could hope to meet, but I have, at times, felt at least a subtle movement away from anger and selfishness, and it’s made a noticeable difference in my relationships with others. My experience pales compared to those of others I’ve met through running and studying the Dharma, people who have overcome tremendous physical and emotional challenges. I sometimes wonder if I could have done the same in their shoes. Then again, who knows? If a serial killer can become a fully enlightened monk, anything’s possible. I don’t know how many people Angulimala really killed, but the message I take from the story – that we all have the potential to change for the better – goes a long way toward slaying self-doubt.